Do you have an excessive sweating problem? Many people sweat when they are hot, nervous, or exercising. But some people routinely sweat through their shirts, socks, or bedsheets at night on a regular basis, without discernible reason. If you can’t seem to control your excessive sweating, it may be time to talk to your primary care doctor or dermatologist, as you may have a condition known as hyperhidrosis. You should be able to find a deromtologist in your local area, we have found a dermatologist in mesa az that may point you in the right direction to what you’re looking for. Many people find talking about excessive sweat embarrassing or uncomfortable — even with a health care professional. However, if you talk to a doctor about your issues, you may be able to treat or stop hyperhidrosis altogether. Here’s a brief guide on how to prepare for a conversation about your excessive sweating with a doctor. Your doctor will want to know details about any patterns in your sweating habits. Do you sweat more frequently at night or in the afternoon? How often do you have to change clothes? Do you experience any other skin irritations along with sweat? Keep a running journal for a few days or even weeks before your appointment to paint a clear picture of the problem. Before diagnosing hyperhidrosis, your doctor will likely want to rule out any other health problems that could be causing excessive sweat. These include potential thyroid problems, heart disease, or diabetes. There is also a test for hyperhidrosis itself, which includes applying a starch-iodine paper to your body to measure the amount of sweat produced. There are two kinds of hyperhidrosis: primary and secondary. Primary focal hyperhidrosis is the most common cause of excessive sweating, affecting one percent to three percent of the U.S. population. It is a condition unto itself, unlike secondary hyperhidrosis, which is a side-effect of medications or other medical conditions. Both kinds can be effectively treated with iontophoresis. While it may feel uncomfortable to talk to a doctor about your excessive sweating, it could help you put an end to your hyperhidrosis for good. Know what to expect before you schedule an appointment so that you can help your doctor help you solve this uncomfortable problem and regain your confidence — no sweat. How Much Do You Know About the Science of Sweat? When it’s hot or you’re working out, you sweat. What else could you possibly need to know about perspiration? A lot, especially if you find yourself sweating more than the average person. The science behind sweat is more complex than you might realize. Here are a few facts you may not have known. The average person has between two million and four million sweat glands acting as the body’s coolant system to prevent it from overheating. We do not have any sweat glands on our nails, ears, or lips. Our sweat glands are most concentrated on the bottoms of our feet and least concentrated on our backs. Only 1% of all sweat originates in the armpits; however, this part of the body is poorly ventilated, so the perspiration evaporates at a slower rate than other body parts. Sweat contains water, salt, potassium, and the body’s waste materials. Our feet can generate a pint of sweat each day. The average person excretes a small amount of sweat about seven times per minute. Sweat is not actually yellow. Yellow sweat stains are caused by the body’s apocrine glands, which excrete proteins and fatty acids. Sweat is odorless. Perspiration gets its distinct odor when it mixes with bacteria on the skin. Women’s bodies have more sweat glands than men’s; however, men sweat about 40% more than women and their sweat is slightly saltier. A hippo’s sweat is red. It protects them from the sun and destroys bacteria on their skin. Horses and primates have “armpits” that produce sweat much like ours. Cows perspire through their noses. 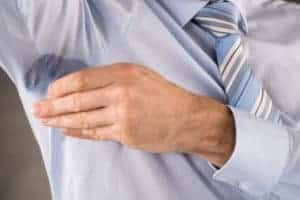 Approximately eight million Americans suffer from an excessive sweating problem called hyperhidrosis, which causes them to sweat up to five times as much as the average person. Between 30% and 50% of patients with hyperhidrosis have another family member afflicted by the condition, indicating that there may be a genetic predisposition. People with hyperhidrosis can control excessive sweating with the use of an iontophoresis machine, which shuts down the sweat glands. Sweating is generally good for you, but sweating too much can be dangerous. Sweat is made from fluid in your blood, which means that when you sweat more, your blood becomes thicker, which puts more strain on your heart. Sweating too much can also cause dehydration, leading to heat stroke and kidney failure. Make sure you always stay hydrated and if you believe you may have an excessive sweating problem, talk to your doctor immediately. Do you ever wake up drenched in sweat? Your bedroom isn’t too warm; in fact, you may even be shivering. So what’s causing you to perspire so heavily in your sleep? Hyperhidrosis. Hyperhidrosis is a chronic condition that causes the body to sweat four to five times as much as the average person. When a person with this condition sweats, there is usually no identifiable cause. Fortunately, hyperhidrosis treatments do exist. For example, the iontophoresis machine was introduced over 50 years ago to help with excessive sweating. Menopause. Hot flashes are the most common symptom of menopause and can occur at any time of the day or night. Therefore, it’s not uncommon for a woman at this stage in her life to suffer from hot flashes that cause night sweats. Medication. Certain medications list night sweats as a common side effect. For instance, between 8% and 22% of patients taking an antidepressant report experiencing night sweats. Aspirin and acetaminophen, often taken to lower a fever, may cause one to sweat at night as well. Hypoglycemia. Low blood sugar can cause sweating at any time of day or night. A person whose blood sugar level drops at night may wake up drenched in sweat. Infections. A number of different infections can cause sweating at night. Tuberculosis is most commonly associated with night sweats, but bacterial infections and HIV can also cause severe night sweating. Cancer. Night sweats are often cited as one of the most common early symptoms of cancer, particularly lymphoma. Anxiety. Sweating is often triggered by fear or anxiety. A nightmare can trigger the body’s “fight or flight” response, which would cause one to sweat. Patients with chronic stress or an anxiety disorder may report night sweats as a frequent occurrence. Do you need help with excessive sweating at night? Night sweats can be both uncomfortable and alarming. As listed above, some causes of night sweats are life-threatening. That is why you should talk to your doctor about possible causes and solutions for your nighttime sweating problem.